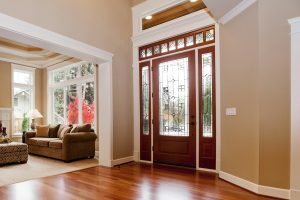 Homeowners in the Western Chicago suburbs can feel confident turning to the experts at The Door Store for beautiful entry doors. We’re a family-owned and -operated company that’s been providing first-rate front doors to homeowners in this area since 1987, and our dedication to outstanding customer service has helped us earn the Better Business Bureau’s prestigious A+ rating. For a warm, inviting look, consider a wood entry door. We carry wood front doors from a number of top-name manufacturers, including Simpson Door Company, Rogue Valley Door, and Lemieux Doors, Inc. If you’re concerned about durability but don’t want to compromise on appearance, fiberglass front doors are a wonderful option. They won’t dent, rot, or rust, and they require very little maintenance. We proudly install fiberglass entry doors manufactured by Albany Door Company, Inc., ProVia, and Therma-Tru Doors. Our steel entry doors are exceptionally secure, making them a great choice for protecting your family and your home. We carry steel front doors crafted by Taylor Entrance Systems. If you’re having trouble deciding between these options, you can rely on our knowledgeable team to help you make the right decision for your home. We aim to provide our customers with the ideal combination of quality and simplicity — we’ll help you select a top-quality entry door through our simple, stress-free process. If you’re interested in having a new entry door installed at your home, give us a call or visit The Door Store’s showroom in Villa Park. You’ll love checking out our full-size displays and our huge selection of hardware options, which will help you visualize what your new front door will look like when it’s installed at your home. You’ll also be able to meet with our knowledgeable team members, who will provide you with additional information and answer your questions. We’ll also schedule a complimentary in-home consultation so that we can examine your existing doors, take any necessary measurements, and provide you with an estimate for the installation.